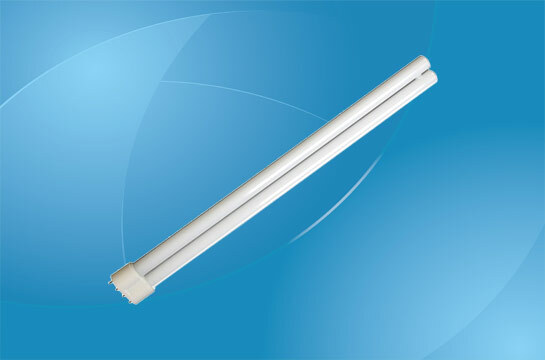 PLL Compact Fluorescent Lamps are known as the cost-effective replacement of incandescent lamps. Research shows that the fluorescent lamp not only has a lifespan about 15 times longer than traditional incandescent lamps, but also only consumes up to one fifth of electrical power. These lamps are designed as energy-saving lights, and come in tube shapes, of different shades of white and daylight colors. The compact fluorescent tubes works with an operating voltage ranging from 110v to 220v. In terms of color temperature, the figures fluctuate between 2,700 K and 10,000 K, depending on type and size. The PLL compact fluorescent lamps have a lifespan of up to 15,000 hours. This is, as mentioned before, on average 15 times higher than the lifespan of the incandescence lamp, that last for maximum 1000 hours. In terms of size, expressed in millimeters per tube, the length varies from just under 100 mm and goes up to almost 600 mm. Apart from their long lifespan and low electrical usage, PLL compact fluorescent lamps are also known for their excellent luminous efficacy. This is measured in lumens per watt. A normal incandescence lamp has around 17 lm/watt, whilst the compact fluorescent lamp has 50-70 lm/watt, demonstrating up to 5 times better luminous efficacy rates. PLL compact fluorescent lamps are slowly taking over the market of traditional incandescent lamps, due to their energy-saving potential and environmentally friendly composition. Local governments publicly encourage the use of compact fluorescent lamps, as they help to reduce pollution and overall energy consumption. The domestic use of compact fluorescent lamps is experiencing a high increase, as end-users are becoming more aware of the product’s potential in saving energy costs. 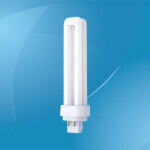 Although a compact fluorescent lamp is more expensive than a traditional incandescent lamp, the fluorescent lamp saves up to 5 times its cost during the operating lifespan. PLL compact fluorescent lamps are designed for indoor use, but can sometimes be used outdoors, although not often. 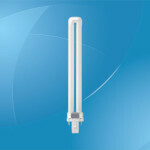 The PLL compact fluorescent lamp can be used in just about any electric appliance in the household, such as desk lamps, fixture lamps or ceiling fixtures. The lamps are also very popular in commercial use, especially as the product is very environmental friendly. Businesses all over the world save cost and contribute to reducing energy waste and pollution by substituting their lamps for compact fluorescent tubes. In this case, the fluorescent lights are used for billboards, sings, security lights, and once again for ceiling fixtures and any other indoor illuminating appliances. From the information presented it is clear to see what PLL compact fluorescent lamps are an engineering advancement to traditional incandescent lights. Among their outstanding features are the incredibly high lifespan capacity, energy saving abilities and of course the potential of saving energy costs. On a global scale, PLL compact fluorescent lamps are the better choice to an environmental friendly energy use, that limits consumption and the harmful effects on the environment, such as pollution.